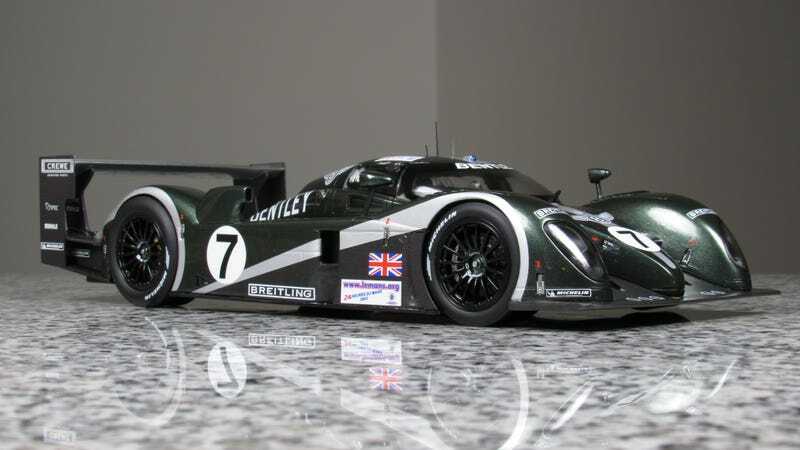 This is the 2003 24 Hours of Le Mans winning Bentley Speed 8, recreated in resin by TSM in 1/18 scale. The third time was the charm for Bentley- they returned to the race in 2001 with a factory prototype team to reachieve the success they experienced prior to World War II. Finishing third in 2001 and fourth in 2002 was not quite enough, but in 2003 they managed to take the overall victory with this beautiful car. This, along with the Lola-Aston Martin B09/60, is one of my favorite looking Le Mans Prototypes. It was driven by Rinaldo Capello, Tom Kristensen, and Guy Smith. Another absolutely stunning replica from TSM. It unfortunately has no opening features, but is gorgeous nonetheless. Everything is meticulously recreated- even the interior which is nigh impossible to even see. The latches for the body panels are among my favorite details on this car. This car does come mounted to a pretty nice plinth, but in extreme DLM fashion I’ve removed it for this photo session. I’ve photographed this model a couple of times now and it never looks as good in pictures as it does in person. I don’t know if it’s the colors or what, but the pictures just do not do it justice.